A placard left inside an AIB office in Dublin by protesters earlier today. There may be some relief on the way for some of Ireland’s struggling mortgage holders. The new chief executive of Permanent TSB says he’s reviewing the bank’s mortgage interest rates, which are significantly higher than those of other State-owned banks. Indonesia has had a grim reminder of the horrors of 2004 today, with two major offshore earthquakes prompting separate tsunami alerts, which thankfully did not result in any major tidal activity. A group representing the country’s plumbing and heating contractors has launched a formal complaint with the Competition Authority over what it believes are uncompetitive practices at Bord Gáis. 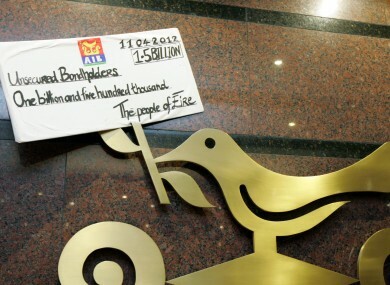 AIB has today paid €1.5 billion to senior unsecured bondholders at the bank, in a move effectively paid for by the taxpayer. In this evening’s Read Me, Stephen Donnelly TD asks why we’re still paying them, and why more people don’t care about it. Notorious mass-murderer Charles Manson is up for parole today – but has indicated he probably won’t bother to show up. If the 77-year-old is denied, he won’t get another chance to ask for freedom until he’s 92. The Irish Banking Federation has refused to meet with residents from the Priory Hall complex, who were hoping to see some “joined-up thinking” about how their mortgages should be treated by their banks. North Korea has defied international pressure by continuing with plans to launch a rocket this weekend, which it says is going to launch a satellite, but which others say is a weapons test. Today marks the 100th anniversary of the Third Home Rule Bill – the first legislation adopted by Britain which gave Ireland its own parliament – being introduced to the House of Commons. Here we (try to) explain what it was all about. Today also marks the 100th anniversary of the Titanic’s docking at Queenstown in Co Cork to pick up its last passengers. Here’s where you can check where in the ocean it would have been right now, 100 years ago. An Argentinian baby has been found alive in a morgue, 12 hours after doctors said it had been delivered stillborn. It was only found when the grieving mother insisted on viewing her child in the morgue, having not been allowed to hold her earlier. It’s almost that time of year when the world’s attention turns to Sheffield for the World Snooker Championships. In the qualifiers, though, someone’s already made history – becoming only the third player to record a World Championship 147 break. Here’s the video. A New York woman has been charged with fraud and grand larceny after soliciting donations for her “dream wedding”, telling people she had leukaemia. She didn’t. The ECB might have to start buying the bonds of its member countries again, after an auction of Italian short-term bonds was a total flop. The lawyers for the man who shot 17-year-old Trayvon Martin have dropped him as a client because he has disappeared. They said before he had stopped returning contact, George Zimmerman had started losing weight due to the public scrutiny of him. The Dubliners are planning to go ahead with a concert this Friday night, as part of the One City One Book celebrations, despite the death of their banjo player Barney McKenna last week. The gig at the National Concert Hall will be dedicated to McKenna. Ever wonder which Springfield the Simpsons live in? Now you have your answer (sort of).